Hanoi (VNA) - A massive influx of migrants from remote northern provinces to the Tay Nguyen (Central Highlands) region has put intense pressure on the local population and has hindered socio-economic development. The Central Highlands is considered a promising destination for migrants because of favourable weather conditions and rich basalt soil. Such movement can be prompted by State policy or out of economic need. In Dak Nong province, home to vast areas of land and forests, migrants move into natural and protected forests, encroaching on land for production or putting up tents illegally. 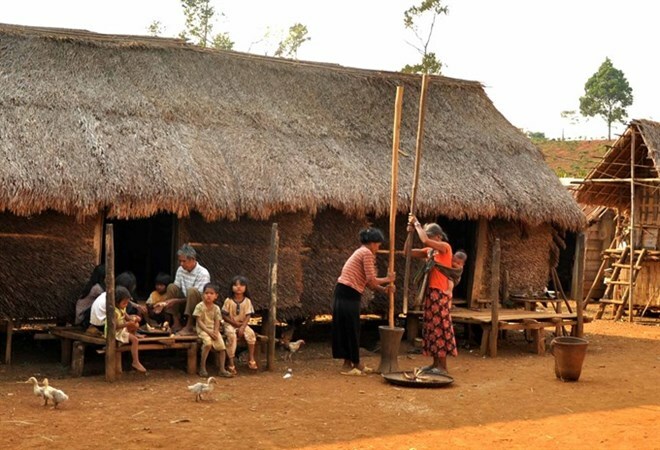 Five years ago, some households moved into zones 1644 and 1645 of Hop Tien cooperative in Quang Son commune, Dak Glong district to live and hunt. Now, up to 126 households are living in the area, causing increased damage to forest land. Nguyen Anh Duc, director of Hop Tien cooperative said that members of the households had damaged the vehicles of forest rangers and attacked them using homemade weapons, such as guns and spears. Faced with such an aggressive reaction, and severely outnumbered, forest rangers and local authorities felt the situation was hopeless. Meanwhile, in Dak Lak province, local authorities are concerned about the pressure on the local population caused by free migration. During the 40 years from 1976 to 2016, more than 59,000 households with some 290,000 inhabitants of 60 provinces and cities nationwide migrated to 15 districts and towns of Dak Lak province. They live among the local ethnic community or in the area under the free migrant stabilization programme. The provincial agricultural sector pointed out that the migrants are mostly ethnic minority groups from disadvantaged northern mountainous area. Despite the advantages of labour supply and diverse cultural identities for the province, the free movement of migration has put pressure on socio-economic growth. Nguyen Van Tam, Chairman of the People’s Committee of Cu Pui commune in Krong Bong district, said that in six out of 13 villages with more than 7,000 migrants, the high rate of third children being born is a big problem. He said that local officials who are also from ethnic groups went to each house to explain to migrants the negative consequences of having third child. But many people still believe that the more children they have, the richer they will be as the sons will help them with farming. For this reason, the dissemination of information has not been effective, he said. Le Quang Dan, Deputy Director of Dak Nong province’s Department of Agriculture and Rural Development, said that migrants destroying forests and erecting tents in restricted areas is illegal. “There are many reasons for deforestation but based on investigations at migration hot spots, we have seen that some groups of migrants are responsible. Police are investigating the worst spots so that punishments can be enforced,” he said. The engagement of local authorities over the past years in ending free movement in the Central Highlands region has reduced the number of migrants. However, the situation has become more complex. Y Giang Gry Nie Knong, Vice Chairman of the Dak Lak provincial People’s Committee, said that the State remains passive in stabilising the lives of migrants, leading to bankrupt provincial planning. He said that there needs to be stronger collaboration between localities from which migrants move from and the ones they move to. The Government and sectors should pay more attention to northern mountainous provinces to stabilise production, improve locals’ incomes and address social welfare to limit and look at ending uncontrolled migration. Disadvantaged localities which lack long-term production conditions must report to the Government to have migration planning put in place following annual State plans, he said. For long-term solutions, the Steering Committee for the Central Highlands Region has asked provincial people’s committees to step up the management of free migrants and put in place plans to stabilise their lives.